Regular visitors will know that this blog is usually about technical subjects, primarily technical management. However, Thanksgivukkah approaches, and I’ve been asked by a number of people for my Mom’s pumpkin nut bread recipe. I occasionally make this for my team, and I can tell you that it’s easy, delicious, and always a big hit. I frequently substitute in whole wheat flour for some or all of the all purpose flour, which works fine as long as I’m careful not to overcook it. Sift together dry ingredients (not including walnuts). Mix so that it’s uniform. Mix flour mixture alternately with 2/3 cup of water into pumpkin mixture. Pour into 3 buttered and floured loaf pans and bake for 1 hour (until a tester comes out clean). 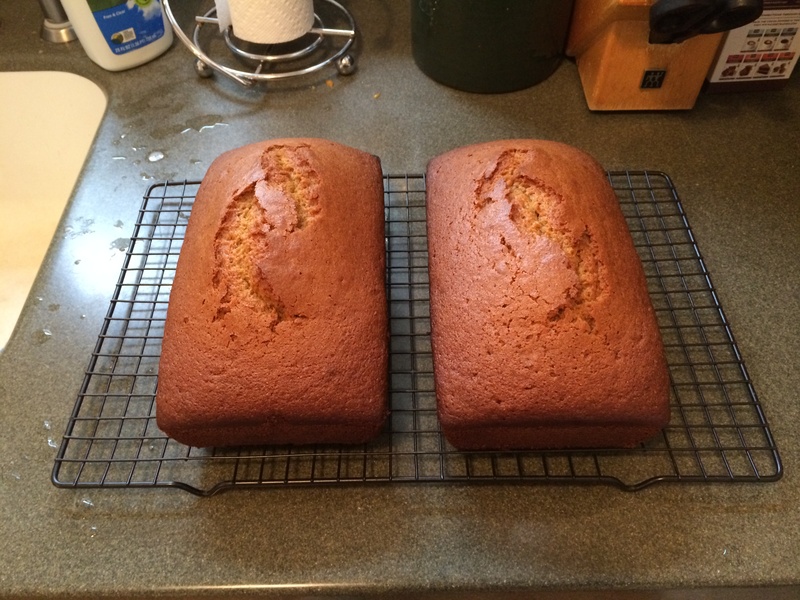 This entry was posted in Personal and tagged Channukah, pumpkin bread, recipe, Thanksgiving, Thanksgivukkah. Bookmark the permalink.